Bento Workshop with Sara of Shiso Delicious. Very excited to be having this lady at 10 Cable to show us her magic of making beautiful Bento box! We met her around a year ago and wanted to do something together ever since. Hope you like what we have planned for you. Sara will introduce us to the basics and culture of bento and the 5 colours, flavours and qualities in typical Japanese food. With simple techniques, tips and tricks she will guide us through her own take on bento – fresher, quicker and simpler to make, plant based and with a fusion of east-west flavours. Together, we will make a range of dishes from Sara’s book Bento Power: Brilliantly Balanced Lunchboxes before assembling and eating our own bento, with some practical tips on styling and food photography. Most of all we will have lots of fun! The recipes are vegan, gluten free and free from refined sugars. If you have food allergies please get in touch. We provide bento boxes for you to use on the day but you can also bring your own. 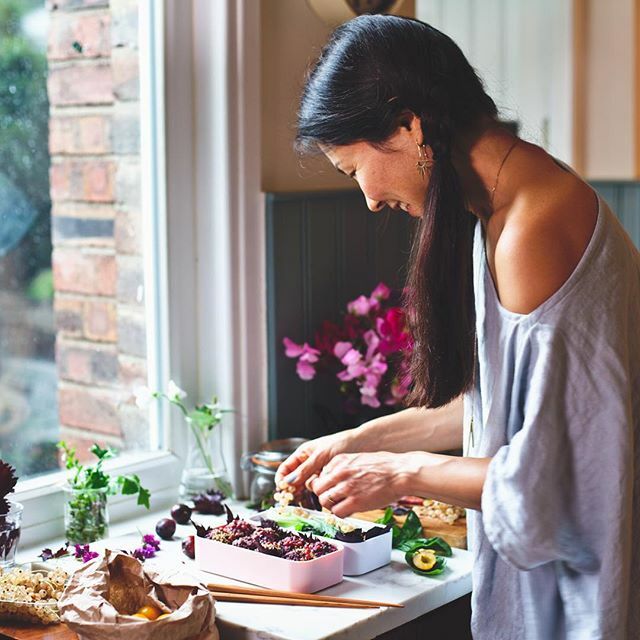 Sara Kiyo Popowa is the artist and photographer behind the colourful, plant based Instagram account Shiso Delicious @shisodelicious and author of Bento Power: Brilliantly Balanced Lunchbox Recipes (Kyle Books). Born a cultural mix-up of Japanese and Bulgarian in the north of Sweden, Sara studied in Japan before settling in London. There, her interest for the healing potential of food grew whilst working in the health food sector first in retail and later as a graphic designer. Wanting to explore her creativity further, she went on to study Dance and Visual Art in Brighton and subsequently had an active practice as an artist and performer. After a newly-wed trip to Japan she started her Instagram @shisodelicious which quickly grew as she uploaded images and recipes of bento boxes she created for her husband and herself. Finally having found a creative outlet which combine all of her skills and passions, Shiso Delicious keeps developing and Sara is now working on diverse projects ranging from creating imagery for well-known brands to running her own workshops in London and beyond.